I’ve been having some interesting, inspiring conversations with one of the owners of Cool Mini or Not, Chern, today in the comments of this blog entry and this one (his insights are definitely worth reading). For a while now I’ve been toying around with a new model for Kickstarter projects in terms of early birds, exclusives, premium options, and pricing structures, and Chern’s insights have made me want to delve deeper into them. I currently don’t have a Kickstarter project in the works, so it seems like a good time to get your thoughts on this model (see polls and comments below). It’s an amalgamation of a bunch of different ideas and mostly applies to board games, but it could work for other project categories too. Please note that I’m neither for or against any of these ideas–at this point I’m just gauging the wisdom of my readers to see what they think. Basically, it’s a different type of early bird structure. Instead of being based purely on time, it’s based on stretch goals. Every time you reach a big stretch goal, the Kickstarter price goes up by $2 to both reflect the increase in price and to reward backers who bought into the game when it didn’t include extra stuff (regardless of when you pledge, all KS copies include all stretch goals). I would close the $39 reward level and open a new reward at $41. You could add extra copies of games for the same price as your reward level, so there’s a big benefit to locking in the best price early on. There is still an element of timing to the pricing structure, but it’s in the hands of the backers (note that I didn’t even consider limiting price to a certain number of backers–I don’t see any reason to do that). As soon as the $30,000 stretch goal is reached, the clock starts ticking for the big stretch goal to follow. And even if you aren’t available to pledge until after a stretch goal is reached and the price goes up, it only goes up by $2. If the project does really well, the price could keep going up, but likely I would cap it at $49 so the reward sidebar doesn’t get too cluttered. One downside to this reward structure is that it would make my beloved premium option very difficult. I’d like to find a way to include it at $59 (some sort of Collector’s Edition), but the gap between $39 and $59 is pretty big, and I wouldn’t want to change the premium option every time I updated the base reward price. There wouldn’t be any KS exclusives, but all stretch goals would be separated into an “enhancement pack” available for $20-$25 directly from Stonemaier Games post-Kickstarter. Also, there would be one constant group/retail pledge level throughout the project at $350, including shipping (it would be for the full KS game with all stretch goals). Keep in mind that this is a departure from what we’ve done in the past. Usually our stretch goals make every copy of the game better. In this case, backers would be creating additional stuff, but they get it for free, while non-backers have to add it separately. Now that I’ve written it out, it actually isn’t all that different than what we did with Tuscany–non-backers can get all the stuff, but they have to pay more (they get it all together instead of in two separate boxes). The last detail is that all individual shipping costs would be paid separately post-Kickstarter (as inspired by Zombicide Season 3). There are a few reasons for doing this: I think it offers backers the most accurate portrayal of the product value. I know it’s standard on Kickstarter to include US shipping (and for us, Canada, UK, Germany, China, and Taiwan) in the cost of the reward, but the negative side effect is that backers view the product as a $39 game ($60 MSRP), while really they’re getting a $60 MSRP game for $29, then they’re paying $10 shipping. $29 is not an accurate value for a $60 MSRP game. The alternative is to charge $49, but backers are still comparing that price to the $60 MSRP. If we tried something like that for shipping, I would include a chart very similar to the one we use now that offers set pricing for the each region–it wouldn’t vary based on weight. And it would be very clearly noted in the reward level that shipping costs would be paid post-project via something like BackerKit. I have a feeling that idea will meet the most resistance, but keep in mind that the reward price will be lower on Kickstarter as a result–you’re not paying more than you usually would. You’re paying the same amount you normally would on our campaign, but the money will be exchanged after the project instead of during it. Also, as Itai noted in the comments, this function could be completed on Kickstarter by simply asking all backers to add-on shipping during the project (including US backers). I’ve found that many backers have trouble adding funds to their pledge, though. These are the three ideas, and I’d love to hear your thoughts in the comments and the polls below. Thanks! Matthew: Thanks for sharing. The model does look fairly similar, though the point of the model I outlined is that you start with the lowest possible price point (it could even be lower than $39–that’s just an example) and increase it by small increments. Ludicreations started at $50 (I don’t see a mention of MSRP on the page, but I’m guessing MSRP is $50) and increased by $5 increments. I think msrp is 55$ for town center, with included expansions at 10$ a pop, also they locked in saying product wouldn’t be sold for less than the KS project. It’s interesting and could be do-able, but i’m not sure many will like this approach. I think with a quickly funding project, such as tuscany, the first tiers would be eaten up so quickly. I will also add Early bird options get people to jump in early rather then see how many stretch goals get reach first. Would you raise the price in the first few hours if a major stretch goal is hit? Because that would be a turnoff for me … I would feel like I was being penalized because I have a job and life that keep me from being glued to Kickstarter 24/7. 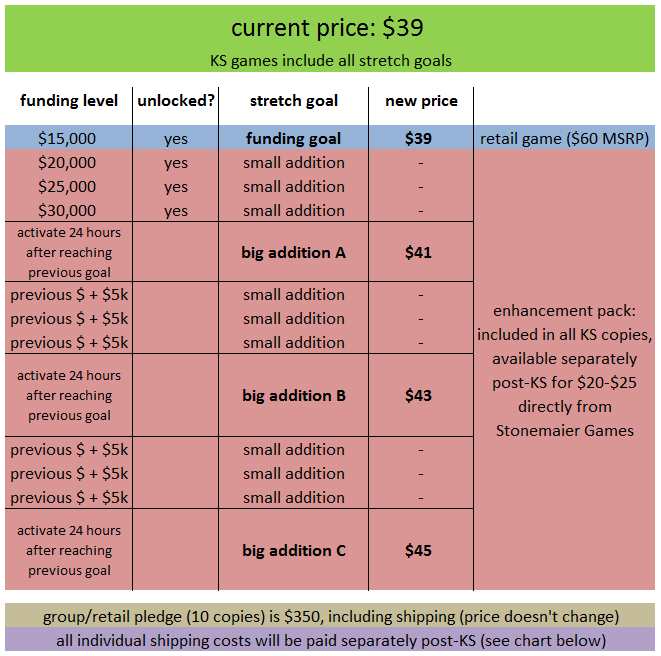 Tajima: If you look at the far left column, you’ll see that the price is only raised at the big stretch goals, and each of those tiers are activated 24 hours after the previous stretch goal is reached. So if the $30,000 stretch goal is met at 3:00 pm on Wednesday, that would mean that the price would lock and a new price would open at 3:00 pm Thursday. Donny: You still have an effect as with any early bird. If you are not there from the start you end up paying more. Though I like that Jamey ‘triggers’ the price after stretch goal is meet. I think we can call this nicely a ‘triggered early bird’ approach. I think that in this case we can expect that the 1st two early birds will be triggered at roughly the same time. I think & honestly I hope for Stonemaier Games does a great job, that the roughly 60k required to trigger 2nd price change can be meet in a day. It begs the question though what will happen then? Will you jump two levels ahead? Or make one of them only last an hour? Konrad: Well, the triggered system would make it impossible for more than one big stretch goal to be reached at a time. I’ll use the example I mentioned for Tajima above: If the $30,000 stretch goal is met at 3:00 pm on Wednesday, that would mean that the price would lock and a new price would open at 3:00 pm Thursday. At 3:00 pm on Thursday, I would write the current funding level on the column to the left. So say the project was doing really well and had reached $58,000 by that point. I’d input $58,000 over there to the left and use that number to calculate the three small goals that would follow. After those three small goals, a new 24-hour clock would start ticking for the next big goal. It’s a good system for staggering stretch goals, but I can see that it might be confusing for someone who discovers the project on Day 20 and wonders why all those weird numbers are on the left. 1. “Sliding Price” – I think it will definitely cause a stir, as it’s the most revolutionary idea on here, but I’m for it. It’s a way of rewarding the “true believers” who back from the very beginning as opposed to those who sit on a KS till the very last minute to see if the package is “worth it”. This is not in judgement of the latter group, there are some KS that I too waited to see what the final package includes. Just the same, though, there were KS where I went in the minute I read the product description. So it’s a way of showing your appreciations for those who believed in you from the get go and didn’t need any extra incentives to pledge. 2. Enhancement Packs – I’m all for it. I don’t like the concept of Kickstarter exclusives (as evident by my stance on the subject in Jaime’s very first “Kickstarter Showdown”), so obviously I think this concept is neat. 3. This is the only one I’m a little more iffy about. Even if the shipping is fixed from the very beginning (something that Z-cide and SDE did not do), I still like to have the price included in the KS pledge. To me – what I’m paying is a whole unit, and splitting it up adds an unnecessary complications. Some games don’t make use of a BackerKit system, as they don’t need it (such as Euphoria, for instance) – so adding one just to manage shipping can add problems and complications where they shouldn’t exist. An alternative would be to provide the base price and drop the included US shipping. So, following your example above – Pledge $29, add $10 to ship to the US, $15 to Europe and $25 to ship anywhere else (numbers are totally spit-balled here). Itai: Thanks for your input. I must admit that the “sliding price” is somewhat different than my current stance on early birds, but for some reason it feels different to me since it’s associated with content, not timing or number of backers. Like you said, you’re rewarding the backers who joined the project even when there were no (or few) extras unlocked. That’s a good point about shipping. Your solution would address my concern and keep the costs self-contained within the Kickstarter project. I like it! I am all for framing the price to US backers as $29 for the game plus $10 for shipping. But backers will want to make one payment, and a lot of people struggle with the “Add $X to your pledge” instructions. In my example, if the reward was $29 and US shipping was +$10, I would guess that a lot of people would forget to add the shipping. Randy: That’s certainly true–many backers find it difficult to add shipping (or add other add-on costs) to their pledges. I am living in the Netherlands, so I almost always have to add shipping, etc. I don’t think it should be a problem to have the shipping costs separated. Randy, this may be true – but I think a post-campaign BackerKit is even *more* complicated. So a shipping add-on may be the lesser of two evils in this case. It’s an interesting idea and not necessarily unique to board games or Kickstarter. Rocketcat Games released their newest iOS game under a similar pricing model. People who bought Wayward Souls at launch got it at the original $4.99 price. They’ve been increasing the price of the app by $1 with each major content update. There was some blow-back from a vocal group of iOS gamers, but I think, by and large, they were successful in driving a greater amount of people into becoming early adopters. I think it’s a smart model for something like Kickstarter, where it’s essential to acquire early campaign momentum, but it may be ultimately detrimental to a company’s brand and/or reputation if enough people dislike it. I don’t think there’s enough data out there to point one way or another yet. Nicholas: Absolutely, it’s not a unique idea overall. There are lots of examples of pricing models where the price goes up (or down) depending on the number of customers. I wasn’t aware of the Rocketcat example; thanks for sharing it. Hopefully some of the data on the polls above will be indicative either way. 1. I like the idea of the enhancement pack. It allows those that missed the KS to pick up some stuff that they might otherwise not be able to. 2. The tiered pricing is tricky. You are getting into territory where you might lose potential backers because it is viewed as a “penalty” for not finding out about the project earlier. I know that when you look at the fact that you’re getting “x” amount more for your money it makes sense, but then they look at one of the early pledge people and say “Sure. But she’s getting the same as me for $10 less”. 3. Shipping. I hope you won’t take too many lessons from a Zombicide campaign, but I’ll get into that in a second. I want to pay one price, up front and forget about it. I don’t want to have to remember to go in 20 days from now and pay my shipping fee as well. It’s more of a hassle for the backer. A chart, much like the one you already include, shows backers how much value they are getting. And as for the Zombicide shipping? The same tier, with the same stuff, from Zombicide 2, was the same price, but included shipping. So was this a change in business practice, or a way to cover up a price hike? A quick rant: Cool Mini or Not…well, I should lump Guillotine Games in there as well, were guilty of one of the most egregious things you could possibly do short of not providing the product at all. Season 2 backers were sent character cards that were all missing the health tracking numbers. The graphic designers just forgot to throw it back on there during the design process. It’s a fairly important part of the game and it’s missing. Their response? Oh, WE don’t use them, so they aren’t important. I know it LOOKS like we screwed up, but we didn’t. Here’s $10 towards Season 3. Their backers, the almost 9,000 people who chipped in $2.250M in the KS alone (pledges through the pledge manager must have come close to doubling that), were left feeling like the company didn’t care. So while the campaign was well run, the follow through was lacking. Please don’t let that happen to you! Dan: Great input here–thank you. As for point 2, that’s been my main argument against early bird pricing to this point, so I’m undecided on it too. As for the shipping idea, I think Itai addressed it well in his comment above. I can do what I’m aiming to do there during the Kickstarter campaign by asking all backers to add in shipping. Yikes, that’s scary about the graphic design mistake. I’m always afraid of that, and honestly, I’m not sure what I’d do. The right thing to do would be to send out revised cards to all backers, but that’s a huge expense and very difficult logistically (especially with our fulfillment system). I would probably just included them for free in the next expansion, though that’s less than ideal. I concur about the tiered pricing. That’s the option I’m not the biggest fan of because I’m generally turned off when there’s early bird pricing I may have missed out on because I didn’t know about X kickstarter (not an issue for me personally on an SMG product) and this is still a price change that would bother me. I also think it would introduce more backer levels which I’m not a big fan of especially when you’d have to scroll past the ones you missed out on potentially. The only kickstarter project I’ve ever cancelled was one where I got an early bird slot when the project launched. Of course after a week I realized I actually wasn’t excited about the game and just got suckered into the early bird hype. I’m sure someone was excited to get my spot but I think it’d be preferable to get backers who were actually excited by the project as opposed to ones that just wanted to lock in a pledge level in case it got exciting. Danyel: Thanks for your thoughts. I agree about the clutter in the reward sidebar–I think that I’d need to keep the other pledge levels to a bare minimum ($1, $39, and $350). Which is what we are doing – which Dan forgot to mention. In context – the exclusive promotional characters had experience numbers omitted on their linear tracker. This did not affect the character cards in the game itself. These experience numbers are not mentioned in the rules (nothing says, if you have 15 experience points you can do this), but are certainly convenient to have – the point that most backers were unhappy about was it meant that these cards were inconsistent with their expectations based on the rest of the range, which is a fair point. It is not an industry norm to fix minor omissions and errors in books, games or the like – which creep in and happen to all companies, regardless of size. Usually, an errata, FAQ or updated sheet is released for a user to print and paste into their book, or maybe even stickers to paste over. On the Z3 Kickstarter, anyone who backs the project gets a full set of the promo cards from BOTH Z1 and Z2 campaigns and a nice plastic box to put all of them in for free. And the Z2 backers get an additional $10 credit on top of that. I think evidence from the Z3 campaign and Z2 comments seems to suggest most of our backers are happy with this compromise and most find it reasonable. We can’t please everyone, although we try to within the limits of our resources. Chern: I think that sounds like a very fair response (probably more than what we would do, given the $10 discount you’re providing). Dan, do you think that’s fair? Were you aware that you’ll get those cards in the Z3 campaign? The shipping costs afterwards is a deal-breaker for me. I won’t knowingly get involved with KS projects that make me, as a backer, jump through hoops beyond simply pledging. When I get an email saying I need to go through some cart system to do what I already did before through Kickstarter, I mentally put them on a checklist of “not backing again”. It’s a mentality that Backers should do what’s convenient for you, not for them. It’s a big business mentality. KS to me should always be personal and responsive to Backer’s needs. I’m asking for help on a project I’m working on first, a business second. The additional work of paying for shipping afterwards is just another example of this. It’s marketing over personal connection in my opinion. Christian: I hear you, and I agree that it’s the responsibility of creators to make backers jump through as few hoops as possible. What do you think about separating shipping but asking backers to add it on during the project? So, instead of the reward being listed as $45, it would be listed as $35, and you would check the chart to add on the shipping cost when you completed your pledge on Kickstarter? As both a backer and a project creator, I think this is the most reasonable middle ground. Many campaigns are starting to go this route (basic pledge + consult a chart for any potential shipping charges). It’s better, but I can math. I know what I’m paying when i click. I know you’ve talked about the way people look at pricing and making something more “sellable” by presenting it in different ways. I suppose that’s what this is. I think the best way is to just mention the cost in the Tier like Derik mentioned. Sure, I like that method too. That’s essentially what I do now with the shipping chart listing the subsidized amount, but I could see value (as long as it’s not confusing) for putting that info in the reward level too. I think that your current shipping chart works, the only thing I would change would be to have a separate pledge level per area (currently 5) so that it is all one cost. Now this does clutter the side bar but is very clear on how much each backer should pledge. It also makes it easier to add the premium level again another set of pledge levels. I think if you left if as is you will confuse a certain amount of people and if you change do have a level for each region you would confuse a certain amount of people. What I do not and could not tell you is which would confuse less people as I think is your goal. To the other points. It is an interesting idea to have the prices match the content added as early birds but I think just a flat out timed based EB is the way to go. Maybe like you mentioned 24 hours after funding the EB goes away. Harbour had an interesting EB where it the EB included one pack of card sleeves. This meant that there was something given to early adopters but nothing earth shattering, again just a thank you. The KS enhancement pack for after the campaign is something that should be done by everyone. If the stretch goal isn’t going to be in the base game then it should be available after in some form. The trick is balancing the retail included goals and any that would go into an enhancement pack, but that is more a problem when a campaign is super successful. Thanks for your affirmation about the enhancement pack as well. I think the key here is that ALL of the stretch goals would go in the KS edition and the enhancement pack, but NONE of them would go in the retail game. So creators would have to make sure the retail version is truly robust and marketable by itself, which I consider a good thing. Jamey: It surely is more than the 7 max that you like to target, but selection of the correct reward would be on the individual. What would be nice to see is KS implement audience targeting. They know where in the world users are from and only show the pledge levels that are targeted to you. Then as a project creator you would define how each pledge level would be targeted to a regions. Once this is done it wouldn’t matter if you have 2 or 20 pledge levels, the backer would only see the ones for their region. I know there are hurdles to the design and implementation of this but that would be the rough idea. Matt: Now THAT is a very clever idea. It’s something they already do in small doses at checkout, so I bet they could implement it into the project page as well. to the United States included. (1) Will people see this and wonder why I’m not including free shipping like every other project does? (2) The total pledge is just 26% off MSRP, but it’s really 50% off + shipping! To give people one more reason to pledge during the campaign instead of waiting for Amazon, I wanted them to get a better price than Amazon. (Games with a similar MSRP run for $22.50-$24.00.) I think $22 feels right and good from a backer perspective, but is a 50% discount really how low publishers have to go to get people a discount on MSRP? It’s a bit more verbose than your version, but it removes the bottom two lines. Yeah, the whole “free shipping” aspect of Kickstarter has had a huge impact on the way backers perceive value. I think you could potentially go up to $25 in this case and be fine, especially since you’re pointing out the shipping subsidy. Ah, I see. I think your method works fine then. Though I think having a backer in, say, Canada, will find it more palatable to add $13 shipping to a $22 product (as they’ll see the subsidy as part of the product) than to add $18 shipping to a $15 product. I’d love to hear what other people think of this approach. Thanks for sharing, Randy. Given how few reward levels you have, I think it works to break them up into multiple reward levels. The only phrasing that strikes me as odd is “any relevant stretch goals.” People may wonder, “Are some relevant to others but not to me?” I think you’re trying to convey that those levels include unlocked stretch goals, but it’s fine to say, “all stretch goals” because the stretch goal section itself will be very clear about what has been unlocked and what hasn’t–I’ve never heard anyone be confused about that language. Interesting. I’m about to launch a KS for a video game and I like the emphasis on early bird specials. I might try to incorporate parts of this in my upcoming campaign. Soupmaster: Just a quick disclaimer: In general, I’m against the idea of early bird specials. I much prefer to treat the entire campaign as an early-bird reward. You can see by the votes on this post (https://stonemaiergames.com/kickstarter-lesson-62-early-bird-pledge-levels/) that a significant percentage of backers do not like early birds. Well! Those are some very awkward points to talk about. Absolutely not a fan of this one. Early bird pricing models, no matter how you structure them, benefit people just for seeing a project earlier. Even if it is $2 at a time, I want someone who joins in the last day to pay the same as me, because they’re putting out exactly the same risk as me (You’re at 0 risk until the payments go through). (And seeing as how I think I was in the first 10 backers for Tuscany and first to back the Treasure Chest, I’m talking as someone who’d only be paying less through the change). On the other hand, if the cost of a project is going up, I think it’s reasonable to ask for more money from backers. I’m not against being asked to pay $5-10 more to get bonus content added because of a stretch goal making it possible, but I want everyone to be asked to upgrade. The downside here is that you will almost certainly have a large number of people who don’t notice or forget to increase their pledge, and hence increase your post-project management to sort it all out. I like this one of course. I think this model should be adopted by all kickstarter projects. Artipia Games have essentially done this with their expansion ‘The Promo’s’ (Or ‘Expanding the Alliance’, as its’ recently been renamed), which is a collection of promo content for the game packaged up for more people to have access to, but at a higher cost (As having backed their projects, the rest of us have it all anyway). It’s a pretty cool way to do it as well, as by doing it after a period of time you can get a good amount of content together to make it a worthwhile expansion, rather than a large shipping cost for a few cards as it might be otherwise ^^. This is the one I like the least. First of all, I don’t like costs being outside the pledge levels, as it’s an extra thing to think about, easily missed, and feels to me as a backer like they’re trying to hide away the cost by not having it prominent on the page (Even at the top of the page, it’s less visible to me than in the side-bar as a pledge level). The suggestion here though is that it’s outside the kickstarter pledge entirely. This then means that not only are costs to me being hidden away until after the project, but I have 2 transactions to make. This makes me uneasy, and vastly reduces my willingness to pledge – I still would with Stonemaier, but a company I’d not heard of? Instant project skip. Now, you have a point here that you’re seeing a cost that is higher than the actual sell value of the game. But..Is that really not a part of the cost? When I buy goods of any kind, the ‘cost’ is what I pay to get it, not what the item costs. If I buy off amazon and it’s £10 + £10 shipping, then IT IS £20 – I imagine there’s many consumers out there who don’t consider that, or buy large quantities of items to get cheaper/free shipping, but that’s no different to saying ‘Well noone has to pay shipping, but you have to buy 10 copies of the game’ – It’s just not comparable. I’m probably going off on tangents so I’ll stop, but well..I don’t like 3, full stop ^^. Chris: Thanks for your comment. As you know, I’m generally against early birds. The only reason I’m entertaining this one is because the prices are tied to the current state of the project. When you pledge on day 1, you’re potentially pledging for a very different product than what someone pledging on day 30 pledges for, but you’re paying the same price. My approach with the treasure chest was to increase the price immediately after the campaign. And honestly, I prefer that method, but I’m wanted to gauge the response to this one. As for the enhancement pack, it is a little different than what we’ve done in the past. Like, for the Treasure Chest, your pledge helped make the Chest better for everyone, not just you. It creates a slightly different environment when the stretch goals are only included automatically for backers. Though even with the Treasure Chest, the post-KS price is markedly higher, so it essentially does the same thing. As for the shipping, your cost point is interesting. I think Amazon has spoiled us a bit. :) Like, if you pre-order a game from most game publishers, the shipping cost is not included in the listed price. But on Kickstarter it almost always is. I do like the raising the price idea, but I personally don’t think it will work. I don’t think it is stream lined enough. I think it will add complexity to a simpler process. I do think shipping needs to be added after for the sake of kickstarter campaigns and comparing to MSRP. You are going to make people angry by doing this but I do think it will be better for kickstarter. I think any changes to the way most kickstarter project are run will be met with adversity. Is there a way to allow them to either add the shipping before or after? I know with one of CMON’s recent campaigns that I backed, it didn’t include shipping. People in the comments said add you could add your shipping before by increasing your pledge level. I think this was in hopes that the shipping money would help hit more stretch goals. Can you tell them that shipping will be added after, but give them the option to add it before if they would like. If backers add shipping after, does kickstarter get their portion from that? Or does Backerkit, get part of that money? It seems like if you could sidestep the kickstarter percent fee for shipping or other add ons that would be good, right? Seth: Yeah, complexity is an issue with the tiered pricing. I wouldn’t want to confuse backers. With shipping, if you add it post-Kickstarter, KS and Amazon don’t get a cut of it. BackerKit has a few different pricing tiers, several of which include a percentage cut of add-ons pledged on BackerKit. It’s lower than the KS/Amazon fee, though. Thanks, Mr. Stegmaier, for being brave enough to throw these different ideas out for us all to comment on. Speaking of which. . .
First, I appreciate what you are trying to do with that adjusting price point. It is a very clever way of leveraging the early-bird excitement in a way that encourages backers to jump on board the moment they see the campaign instead of waiting, while minimizing the “cheated” feeling with a small price adjustment. The problem I see is that you are combating typical early-bird woes with logic. Considering most backers will skim through your page and back emotionally, I don’t think this will work out as planned. Right now, our experience of your engagement with a project is a great bonus for supporting Stonemaier Games. If you implement this “sliding price” I’m sure that you will spend a lot more time putting out little fires from confused backers who didn’t read all of your helpful explanations. Second, I really like the second point of a Post KS-Enhancement Pack. I was planning on using a very similar model for my future campaign. Third, I completely agree with Christian. I hate when a campaign has me go through something like Backerkit – especially the systems which require me to input a coupon code for the items I’ve already payed for (campaign pledge amount). While I have backed some of those campaigns, like Christian said I felt dismissed. While Itai and Randy have a good point about including the payment in the campaign, I would suggest listing the price breakdown ON the pledge level instead of requiring us to add extra. Since backers will have to read the levels to tell which one they want, simply state on the top line that this is $39 (game) + $10 (shipping). It’s right in line with the awesome recent trend (which I think you might have started) of having separate pledge levels for the different destinations with international shipping already included. Thanks for your thoughts, and I’m glad it’s clear that I’m just putting these ideas out there to gauge the response. I really haven’t formed my opinion on them yet. That’s a great point about the emotional aspect of backing a project (opposed to the logical one). That’s a big part of the reason why I haven’t done early birds since Viticulture. I lean towards continuing the trend of making the entire campaign the early bird reward. I’m actually not a big fan of that trend you mentioned at the end–I’ve avoided that because of the clutter it adds to the reward sidebar. I’m not completely against it, but for some reason I’m not a fan of it. I think all three ideas are good. The biggest problem I see is US backers getting upset when they “discover” they will pay shipping later or need to add it on. I don’t think the sliding price is an issue and I think the separate rewards package available after the KS is a great way to have exclusives without Exclusing people. Eric: Thanks for your input. I agree that backers definitely don’t like unexpected surprises, especially if they involve extra money. I like the shipping separate idea, I’ve now gone through it with I think 3 games on KS. It allows me to potentially spread out some of the cost over 2 paychecks. My big issue with it though is that you need to give some sort of (well informed) estimate on your page for key areas. If you don’t say anything for my general part in the world, then I might not even consider backing because the risk is too high. I imagine myself someday thinking “How high could it be?” and then getting slapped with a $50 fee, I can’t count that possibility out. And you can’t say ‘around $15’ and then when I go to checkout in Backerkit or wherever it’s being done, I now see a $25 fee, and an update goes out saying “Ohh, we miscalculated. We’ll refund if your whole pledge if you really want”. By that point, I’m excited and invested in your game. I don’t want a refund. If I take your refund, then know it’s because I don’t have faith in you as a company anymore. But most of the time I won’t, I’ll just be dissapointed and weary. *When I say ‘you’ I mean any companies that are thinking of this approach. I think the stretch goal thing is interesting, but it looks like a lot more work, and it would be a lot of trouble to explain it to people all of the time. I can see a lot of people not liking it. It punishes people for not finding your campaign in time, and if a lot of stretch goals get hit at once, then the price will spike. Nik: That’s an interesting point, that split payments lets you spread out the cost over multiple paychecks. If I ever did it, I would give a definite shipping cost up front. Indeed, I wouldn’t want to enact anything during the campaign that punishes anyone–that’s my general reason for not doing early birds. In this case, the layout of the stretch goals would prevent a price spike, because each price increase wouldn’t trigger until the previous goal is met. Gosh, that table is interesting. I admit, I misread it the first time – I interpreted it as people who backed early would need to increase their pledge each time a big addition was activated. So I got over that hurdle and realised it was essentially a series of early bird levels. I’m not sure how I feel about it. Early bird levels in general annoy me because I usually miss out on them! (That doesn’t mean I’m not a “true believer” though, thank you very much). In a practical sense though, the later someone comes to your project, the more they’ll have to scroll through to find the pledge level that is still open and the more they’ll see that they missed out on, price-wise. The thing I find unusual is the “activate 24 hours after reaching the goal” – I assume you’re trying to give more people a chance to get in at the lower pledge level before the price rises. Personally I think that’s a good thing, although I wonder if the delay will impact the momentum of the project (for better or worse?). I think I’m cautious about the proposed approach. I’d be interested to see it in action. It is a change to how you’ve run previous projects and I can see how it would annoy some people. I would probably find it a little off-putting (the price rise feels a bit like a penalty) but if I liked the project enough I would still back it. I think that you could do well with it because of your established fan base and presence whereas another project creator may not. Do you think you’ll see a higher rate of dropped pledges near the end of the funding period? You might find that people back it to get the cheaper price and then later drop the pledge (or ask for their money back post-project) because they weren’t that enthusiastic about it but got sucked in by the idea of getting in while the price was low. I *love* the idea of being able to buy enhancement packs afterwards and I *love* the inclusion of all stretch goals in every pledge level. Very few things on kickstarter frustrate me more than having to sort through 18 or so pledge levels, trying to figure out which one will give me the best set of stretch goals. I’m definitely against the paying shipping separately using backer kit – I hate being charged twice for something. I get hit with currency conversion fees on all my kickstarters and I prefer to get the pain out the way in one fell swoop. The rest of the world is smart enough to adding additional shipping to their pledges on kickstarter, why not do it that way for the US too? That way everyone sees clearly the price of the game vs the price for shipping. That said, (and this may be peculiar to me, or possibly it’s a more international view point), the price for a game is the total of the pledge level and the shipping. The proportions of game to shipping cost matter (I won’t pledge for something where the shipping costs more than the game), but ultimately the final price of the game includes shipping. Because that is what it costs for me to get the game. That logic applies to everything I buy online though, not just kickstarter. Helen: Indeed, I can see how the chart might convey that you have to add more to your pledge to keep up with the stretch goals. That’s confusing. You’re right that scrolling through closed early bird reward levels can be discouraging–it taps into the emotional aspect of early birds that Derik mentioned. It’s possible that we might see a higher rate of drops later on, but if we’ve hit a lot of stretch goals at that point, I could see people hanging on just because they feel like that got a good deal. As for your last point about shipping, I think perhaps the key that’s missing is consistency. Since you’re in Australia, you consistently have to pay more for shipping, so you’re used to is. But in the US, I hardly ever have to add on shipping on Kickstarter, but if I order a game directly from another publisher’s website, I do have to pay for shipping, which makes it feel more expensive. Or, for example, with Viticulture the price was $39 on the Kickstarter campaign (including $10 for shipping), but when Cool Stuff sold it for $39 (not including shipping), I heard backers complaining online that that they should have just waited for retail (even though the retail version of the game was different than the KS version). It’s all about perception. I couldn’t quite work out what the problem was, but I think that’s it. I really like the first two ideas A LOT and I look forward to seeing if you implement them, and the success they have. The shipping concept seems great but could be problematic. Try to get all your backers to make a separate payment afterwards might pose a challenge. Personally, I like a simple chart that backers refer to during the campaign, that they use to add shipping costs to their pledges before funding. Jason: Yeah, the shipping chart is what I currently use, but I still don’t think that backers who get the “free” shipping really understand how good of a deal they’re getting. So I either need to find better ways to communicate that, or I need to ask all backers to add on shipping (during the project–I’m sold on not doing it afterwards via Backerkit). I really don’t know if I’ll implement any of these ideas at this point–I’m just gauging peoples’ opinions. Right now the only clear-cut yes is the second idea. Jamey, so you are in favor of early bird pricing now? Seems a bit weird considering your comments in the Forge War interview with Isaac Childres. Anyway, it is a turn-off to discover a project and see a bunch of expired pledge levels, even if the current price is less than MSRP. Also, I won’t back a project that requires me to pay twice, first on kickstarter for the game and second on backerkit (paypal?) for shipping. This seems like a way for project creators to avoid kickstarter/amazonpayment fees on the shipping portion of the total price and also lowers the total pledge amount to slow down stretch goals? Why not just do stretch goals by number of backers? Also, allow pledges to add the shipping to the ks pledge amount. Darren: I’m not in favor (or against) of any of these ideas–I’m just putting them out there to see what people think. Was that not clear in the post? I do see this early-bird concept as a little different than other early birds. This one isn’t based on time or number of backers, two factors which are completely disconnected from the value of the game. This one is based on things that have actually been added to the game. Love the table – Anything to make what is and isn’t currently unlocked, and when things will be unlocked, easy to tell at a glance is a great thing. Especially when it gives ‘what is included in the project for all’ and ‘what are you getting as a backer that you wouldn’t be getting otherwise’, effectively, for ‘free’ clearly. While my main issue with early bird reward levels is that they can clutter the reward teirs somewhat, I prefer no early bird levels, in actuality or via the gradual price increase as the content increased. Additionally, I do not believe that someone who’s put off by early-bird levels wouldn’t be put off by this system. While I dislike early bird levels, prefering you’re inclusive minded approach, I’ve never been put off by one, however. One practical consideration, beyond how likely people are to be put off by it, how would this system work if your funding level dipped below the threshold that increased the price? While I hope that wouldn’t happen, it’s a good idea to think about how such a system would handle it happening before trying it out. I’m also unsure how increasing the price to reflect the new level of content interacts with what you’ve previously stated about unlocking the stretch goals in such a way that they’re now cost effective at the older price point. Would the tabular approach to presenting information you’re suggesting make sense for including some in the game for everyone, and some as post kickstarter enhancement packs, depending on which makes more sense for what stretch goals? I very much dislike the idea of money being exchanged after the project being a *required* part of the process, and you’d need to be very careful to explain it in a way that makes it clear that this will be happening. Your method of including $X shipping and having people add on according to a chart is better, however inconvenient adding the shipping on manually is – it’s less inconvenient than requiring two payments. Not all that fussed if $X is $0 or $10, as it currently is for your projects, although at your lowest rate of shipping is more convenient for more people. Gizensha: Some great points/questions here. That’s the question with every stretch goal system, right? :) It’s compounded here by the change in reward price. I’m not sure if there’s a good way around it except to say that once you unlock it, it stays unlocked. Right, that’s a key argument against it (I think you’re the first person to bring that up, so bravo!). The truth is that big stretch goals rarely coincide with money saved by economies of scale. Add a few cards to a game? Sure, economies of scale will cover that. Add a new miniature to the game? Not so much. It helps get you closer to covering it, but the increase in units doesn’t cover much of it. The all-or-nothing approach is what’s new here–there are plenty of projects that offer a mix of permanent improvements and KS-exclusive improvements (or, in the case of Tuscany and the Treasure Chest, all stretch goals were improvements to every copy of those products). I actually think this would be good for creators, because it would force them to include in the retail version of the game all of the stuff needed to play the game instead of shifting some of that stuff to the stretch goals. It would also give creators more freedom to include component and gameplay “exclusives” in the stretch goals, because they wouldn’t really be exclusive–they’d be in the enhancement pack. My guess is that this solution would be very compelling for backers, because it would be abundantly clear that they’re getting something worth $20-$25 for free. Well I believe LudiCreations is the only one who has tried this and the results certainly don’t look great. Actually losing money and backers during the last 48 hour push.To me all this would do is get people to jump in early and then make up their mind later about whether they should back out or not just to save a few bucks (I have used early birds and done this on a handful of projects). To me it leaves me more frustrated with the creator that if I am interested in your product I have to be there early and commit a pledge early, then make up my mind if it’s worth it, then decide whether to keep my pledge or cancel. In my opinion, there should never be a need for the first step otherwise it becomes a game as to who can get their first and get the best deal. Jim: Thanks for your thoughts. The first commenter, Matthew, mentioned the Ludicreations experiment. I think the difference is that they started out with a pretty high price, and the price jumped by $5, not $2. But it is similar. The reasons you state are why I generally stay away from early bird rewards. I kind of like the idea of the shipping being separate after the kickstarter but the main reason I like that is the number of times kickstarters get timed to end the day before I get paid.. and being able to separate the shipping until a later time could mean I can back for more and get multiple copies. Michael: Nik mentioned that same concept above–I hadn’t thought of that, but I like it! Being a US backer, I fully support the changes to shipping. I think it increases transparency in the process and helps non-US backers to understand they aren’t subsidizing US shipping. I’m also just fine with anything unique to the KS being made available after the fact. It’s great when a campaign unlocks some awesome rewards and I’ve never been of a mind that it makes me special to have them while others don’t. The one part I’m sketchy on is the increasing price. I know I like it better than the existing early bird model. If I hate to rate the way early bird models work from worst to best, it would be limited number, by day, slow release (this system), and none. It’s obviously the best system so far in that it only bumps the cost when a specific goal is unlocked and allows for a slow progression that still rewards early backers. I think it’s going to definitely be the most polarizing aspect of the proposition though. People don’t like the price progressively changing. It feels a lot like the Shadows of Brimstone mine cart pledges. But $2 isn’t very much at all so it may be more readily received. Either way, glad to see people exploring possible changes to the system. Donny: Thanks for your thoughts on shipping (especially as a US backer!). As for the increasing price, I like that ranking system (with “none” winning). I tend to agree with that, and I was curious to gauge the overall response to the idea. Incremental pricing: I like it, if it’s indeed a small increase. I’m not sure about the “activate big addition 24 hours later” part though: if it’s automatic and not tied to a monetary goal, it’s in fact just a second part of the previous stretch goal but with a delayed reveal, which sounds a bit misleading. I’d just make the big addition itself the goal, and increase the price 24 hours after it’s reached. Enhancement pack: yes please! I love promos and small additions, but when I find I missed out on exclusives for a game, I’m much less likely to buy it at retail later. And ironically, I almost never use the exclusives for the games I did back, due to fear of damaging or losing them. Knowing that I’ll be able to replace them later if anything happens will put my mind at ease. Separate shipping: I’m all for it as long as the price (or at least an upper bound) is specified upfront, unlike the recent Zombicide campaign and some others; as I live in Brazil and many projects now require a more expensive shipping option, I’m afraid of being hit with a much-higher-than-expected cost afterwards. It also seems to make more theoretical sense: since you won’t be able to spend that money on production, including them in the pledged amount makes it less clear how much you actually have to make the game. Creators currently need to estimate what ratio of the pledges will be for shipping and adjust the goals accordingly, but that’s imprecise, as it depends on the geographical distribution of the backers. OTOH, telling backers that they can add the shipping amount at pledge time but don’t need to will further confuse the goal calculation, since you’ll need to estimate what ratio of backers will do that (and that may even change as the project advances, as backers who had not added it initially may decide to change their pledges to help reach a certain stretch goal). Davi: Great comment! I see what you’re saying about the big goal. Honestly, part of it is to spread the excitement of a project over multiple weeks instead what happened with Tuscany, where stretch goals were reached so quickly that few of them got any attention. I can understand why Zombicide isn’t setting their price up front due to the large variation in weight, but for any game we produce, I don’t think that would be an issue at all. I’d much rather provide the set weight up front to be clear. I feel like I saw another project recently offer a range, with the disclaimer that the final shipping price would be no bigger than the high end of the range. I would prefer if Early Birds weren´t needed at all. However, I do prefer the system you present compared to traditional early birds. In this way you feel you get something for the increased cost. It think it is important to have some timers, though. I would hate to e.g. miss the first 6 levels because I was sleeping when the campaign launched, or I wasnt close to internet on the first day. In addition, I strongly dislike the Enhancement pack idea – especially, if the pack is only distributed from the US. E.g in Europe it would mean that the pack would cost more than the game itself (20-25$ + 10$(?) shipping + 40-50$ fees = a lot). I think most people would be discouraged by these costs, making the pack kickstarter exclusive in practice. As you have stated before, Kickstarter exclusives will make many people turn their back on the base game. Kelmantor: It sounds like you dislike the Enhancement pack IF the publisher doesn’t have a good worldwide fulfillment system. You know how we work–the enhancement pack would be stocked at Amazon.co.uk, so it would be more like $6 shipping + $0 customs fees. The alternative would be to enter the enhancement pack into traditional distribution, but to do so we’d have to mark the MSRP up to $40 because distributors get 60% off MSRP. Just to correct you there, I’m one of the owners of CMON, although I am an employee. Shipping is expensive, and most projects don’t make a profit from it (as they shouldn’t) since they’re not running a logistics Kickstarter. Projects take a while to finish. We’ve had postal and courier rate hikes happen on about half our projects due to various fuel crises, wars, inflation or just because (USPS). This makes an accurate prediction difficult. Projects can inflate in scope, meaning more items to be shipped than originally planned. This makes an accurate prediction difficult. Very few backers or even project owners remember to factor in Kickstarter fees when planning shipping. Kickstarter isn’t going to give their 5% cut on shipping collected to USPS or Fedex to fulfill rewards. 5% is A LOT since it’s a direct cost, and not a margin a project is giving up. All our projects, from project #1 (Zombicide) to project #12 (Zombicide 3), require the use of our pledge manager. No exceptions. At a very basic level you have to login and confirm your address and everything that you asked for is what you really want to get. This is additional friction, but in my experience completely necessary (and why 3rd party providers like Backerkit and Kicktraq’s Pledge Manager are so useful). In our pledge manager, you have an opportunity to modify your pledge, address, and pick up additional items you either missed or couldn’t afford during the campaign itself. Very recently, we added the ability to pay for shipping in the pledge manager – in US$, Euros and other currencies depending on which logistic service is specific to your location. This means we don’t need to artificially buffer for exchange rate vagaries making it a far more fair and transparent process. As an example, we used to charge $25 for shipping in the EU for a large boxed game. For Dogs of War, if you’re in Germany, that charge is now about 9 Euros, roughly $12. We see similar price reductions for most of western Europe, Australia and Canada. Conversely, USA shipping is now anywhere between $6 to $8 via Fedex, which used to be hidden in the pledge level. The countries where we don’t have real hubs to reach (yet) – Brazil for instance, are expensive to ship to, at least $50 – where we were charging $25 before, we are charging what it costs now. 1. Additional friction caused by having a pledge manager – this is well worth it in preventing a ton of CS issues and efficient email support back and forth. It certainly hasn’t hurt our campaigns and I would have to say it is absolutely essential on projects that offer 5 or more SKUs/accessories/products. 2. Charging for shipping after the fact didn’t seem to hurt Reaper’s Bones II and also more accurately reflected the true performance of the campaign, rather than an inflated total with shipping built in. It doesn’t seem to have had a significant negative impact on our current campaign either. One of my partner’s professors in business school used to run a billion dollar online retail business. His observation running an ecommerce site through the 90s and 2000s was that most of his customers didn’t value free shipping – it didn’t motivate sales positively (or negatively, if absent) in any significant way. This was a guy who did a ton of A/B (and sometimes C) testing on phone ads, online ads, price points, etc so although his anecdote might be 10 years out of date and his products had price points north of $100, it still bears keeping in mind. This ultimately comes down to a question of trust that the project creators will be honest about what shipping costs – and it is fairly easy for anyone to get shipping quotes for individual packages at any time. If you can’t get it sent to you any cheaper than we can, I think it’s a pretty fair deal and this is how we’ve presented it. Chern: Thanks for the clarification–I’ve updated the post to reflect that you’re an owner. And thanks, of course, for your comments about shipping. It’s been very interesting to gauge the response here. I think you all are making a bold, key step away from the norm on Kickstarter for including shipping in the reward price–as I noted in the post above, I think the norm has been a bit deceptive for backers, so I’m glad you’re challenging the status quo. You could probably get away with it because you do a lot of previous homework and most people will be well aware of when the launch is, and I think the scheme makes a lot of sense financially and logically. It’s just that I can see the emotional response of backers not being too positive, because, well – it’s an early bird program, and you have persuasively argued that EBs range from ambivalent to counterproductive as you approach $10 or so differences. Particularly if, as has been pointed out before, you reach A and B in two hours, and knock down C, D and E in the following three days. You are now looking at a $10-$12 surcharge for backers just for not being there at the very first possible moment, and the pledge level list has become a confusing hodgepodge of limited levels in the process. On the other hand, if the project funds modestly and you reach, say, B in the final moments of the campaign, then you have had to give all kinds of confusing explanations for what accounts to a $2 early bird for people who got there before A.
I dislike early birds, but I’m usually not particularly irritated by them because I’m active enough in the relevant areas to jump in early in projects that interest me, and I have my tricks to poach EB slots which have worked fine in a few occasions in the past. ;) But I personally can’t see how this scheme, no matter how well intentioned it is, can be reconciled with a philosophical opposition to early birds. “Better” early birds are early birds all the same. 2) I like the idea. Chris has pointed out that Artipia does essentially that. It offers an incentive for backers without punishing retail completionists, and if the campaign goes well it adds a lot of value to the KS copy. My concern would be whether it will push the funding level too high to be a hurdle to the campaign, particularly for first-time publisher. I’m particularly thinking about Viticulture and the custom wooden bits – the retail copy would either have been a pretty sad sight next to the KS copy (with discs, cubes and/or regular meeples instead of custom pieces), or you would have had to include all those goodies in the base game, perhaps making the funding goal unrealistically high for a first project and turning people away from it. Also, the natural evolution is for people to ask for packs including the Enhancement Pack along with the game, so a solution allowing retailers to carry them as a service to retail buyers might be of interest. a) If the shipping costs are fixed, why can’t I pay for them upfront? b) If the shipping costs aren’t fixed, how can I be sure of how much this is gonna cost? Reasonable or not, these are valid concerns, and will resonate with people. Also, the “hey, online retailers don’t add shipping so we’re even” line of thought does not always apply. A *very* typical perk (at least in Spain) for FOGSs is free expedited shipping over a pretty reasonable amount – you usually qualify as long as you order two or three “regular-sized” games (talk Euphoria or Ticket to Ride), and it’s usually easy to interest people in doing a bulk order. I don’t think I have paid a cent in shipping costs in a single one of my orders to local online game stores, and mind you, they have been too many to openly admit. :P The limit is usually about 60 €-80 € or so, with most stores offering additional discounts to gaming clubs from about 100 € onwards. So, for all intents and purposes, I only count on paying shipping costs when ordering from amazon.de, and the shipping costs in KS enter the calculation just like the base game price. The deal is usually still good, it’s just that the ‘shipping/game’ separation does not enter the picture for practical purposes (well, unless the shipping surcharge exceeds 40% or so of the game price). Again, I can see how it would make sense financially, specially given that shipping costs added to KS contribute towards funding – it’s just that it’s something which will turn some people off and add a layer of complexity for backers and creators alike. As a general conclusion, equally applicable to 1) and 3) (and partly to 2) depending on where the goal ends): my feeling is that these ideas could work fine for an established publisher, but I would be pretty wary of doing it for a first game, as I can see how they could turn a sizable number of people away from your game. As for the enhancement packs vs. the retail version, I see what you’re saying. I would still want to sell plenty of retail games, so the retail version would still be very nice. The enhancement pack would have premium components and additional gameplay components that extend/enhance the game. It’s possible that we could enter those packs into retail distribution, but we’d have to hike up the MSRP to make up for the 60% cut that distributors get. So, here’s my ideal solution for shipping: No reward would include subsidized shipping (and the price would be lower as a result). However, all backers would need to add on shipping during the project. The problem is that many backers would forget to add it on or don’t know how to add it on, or they would be confused when they add it on because they’re not sure if I know it’s been added. Those are the types of things I’ve run into with the most basic add-ons, so I can only imagine how it would be if everyone had to add on shipping. It would only work if Kickstarter added a more robust, automated shipping selection system. Agreed that stating it in the reward level is the best way about it, as it maintains the simplicity of click once to get the reward you want. Something you could try as an experiment (Perhaps on treasure chest 2.0 ;P) would be to have both the shipping-later and included-shipping levels. $25 – The Game, add shipping to pledge according to the chart or via paypal post-campaign. $45 – The Game including shipping to Mainland Europe. Chris: That would be an interesting experiment. I wonder if I’d have a lot of people who back the $25 level thinking that shipping is included (even if I specifically say in the reward level that it’s not). I do like how the $25 level emphasizes the actual cost of the game by itself compared to MSRP. First time I don’t agree with you. This sound like an early bird through the backdoor. Sometimes you miss a Kickstarter-start and might lose a day or two and the campaign already skyrocketed up to the next three stretch-goals, which is not unusual, especialy in case of your games. This sounds opposing to your idea of the best price for everyone. Not too fond of the shipping idea either. Itai R. explained it very nice. Ian: Just to clarify, this isn’t really a blog entry for agreeing or disagreeing. I haven’t formed my opinions on these ideas yet–I just wanted to share them with you all to get your opinions on them. My philosophy has been anti-early birds for a quite a while now, and that hasn’t changed. “This sound like an early bird through the backdoor.” Very nicely put Ian. Generally, Kickstarter applied strategy is: decreasing the backers cost through adding the products value via the stretch goals. The proposed approach on the other hand looks the opposite. Though you still have the stretch goals thus it would feel more like you try to balance the additional costs for you with the profit from later backers. I would like to see it done even if purely for scientific point of view. The more I look at it and think about it, it seems to me that the best would be to increase the price of a pledge, from the start, by $5 or $10 in case you want to keep the magic of the number 9 working for you. It all depends from the components a game has but still considering how people are happy from your games the price of $39 is ‘near’ dirt cheep considering it is delivered to your doors. Particularly from my perspective that I live across the ocean. Certainly, I would include ‘Derik’s line’ mentioning shipping cost. I strongly believe that it is best to keep the shipping simple & under your control all the time. A good example of how a bit of miscalculation could bite you back please see (particularly the latest updates of) the Wands project ( https://www.kickstarter.com/projects/51318376/wands-fantasy-card-game ). I backed the project but I was at least twice very close to just cancelling it all together because of all the confusion and the shipping in the end nearly tripling. Luckily the author gathered all together and I am waiting for my copy. Yeah, it’s definitely an early-bird model. The interesting thing to me is that even though I’m against early birds, I used an early bird system on the Treasure Chest. The difference is that my early bird pricing expired when the KS campaign ended, after which a new price was set for pre-orders. I think that’s fair, but it’s still an early bird method. You have to draw the line somewhere, and currently I draw it at the end of the KS project. I agree that it’s important to keep shipping as accurate, simple, and under control. That makes sense to me. “I used an early bird system on the Treasure Chest”. Sorry, but I strongly disagree with that assessment. By your very own definition (KS Lesson #62): “An early-bird reward is a limited pledge level that is strictly better (usually in terms of price) than a comparable level.” So, as long as you are talking about KS campaigns, I don’t think comparing the KS prices to what happens outside the campaign is fair game. After all, there’s a definite difference between backers and other customers, in that the success of your campaign hinges on the first group. It’s fair to give them something in exchange. I understand what you mean, but referring to that as an ‘early bird’ will open the doors to a new world of confusion, and the “a KS campaign is a campaign-long early bird so it’s totally the same if I move the deadline to the middle of the campaign” line of reasoning is very difficult to buy. andvaranaut: I think we’re getting into semantics a little bit. :) By your definition of the “success of your campaign,” an early bird reward could legitimately trigger the second you reach your funding goal. My point is that people have different definitions of early bird, and regardless of what those definitions are, I want to find the best way that does the right thing for backers/customers and creators. My philosophy on early birds during the campaign won’t change until someone convinces me it should change. :) If the vote on the first poll was significantly in favor of the proposed early bird method, I might seriously consider it, but it’s too close. The results of the second poll are very clear, though. I think I agree with Andvaranaut. It is semantics somewhat but “early bird” is a known term around Kickstarter and most would take it to mean getting a pricing discount for discovering the project sooner than 99% of the other backers. Not getting a better price than non-backers. Really, Jamey is offering a “backer-perk” or “backers only” price. Just being a backer means better pricing compared to retail. Hey Jamey! 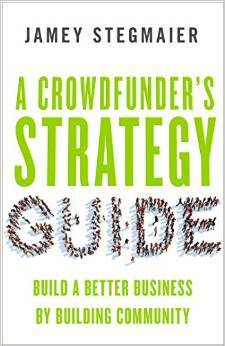 Very interesting thoughts on ways to innovate the Kickstarter business model. I like also that forums like this are almost the equivalent of play testing your ideas. You get to see which ones work, and which ones are broken. From everything that I’ve learned from Board Game University, the most important tip has been to Play Test, Play Test, Play Test. I just wanted to provide some thought that might just give you a different perspective, and I’m mainly going to touch on the topic of the price scaling with stretch goals. For the sake of comparison lets say your scenario and mine are equal. Imagine instead of an increase in pledge amount at each “Big Addition” stretch goal, if rather at that point a new starting line was formed for any new backers. So what does that look like? After “Big Addition A” hits, any new backers still back at the original $39, but instead start working towards the stretch goals that those who backed prior to “Big Addition A” have already achieved. Meanwhile the original backers begin to work towards “Big Addition B”. Thus once “Big Addition B” is reached by the first set of backers, the second group of backers is achieving the stretch goal of “Big Addition A”. At that point a new cycle begins, first group is working towards “Big Addition C”, 2nd group towards “Big Addition B, and any new backers now form a third group working towards “Big Addition A”, and this can go on and on up through any additional “Big” stretch goals you may have. I feel like this is a viable comparison because you are comparing one module that says you will receive the same for more money, and the other module says you will receive less for the same money. Now people would see that and just because I use the word less in the 2nd scenario would say that they are losing out more in the latter, but they are not. The two are the same. In each scenario the value of your dollar gets you less than that of those that pledged before you. So with that said, do you value the people that pledge later less than the people that pledge early? I don’t believe you do. Yet if you value you’re backers equally I feel like everyone that pledges in the window of the Kickstarter campaign should get the same value out of the Kickstarter campaign whether they back day one or if they stumble upon the campaign with minutes left. I feel like I’ve been on both sides of the coin, through Stonemaier games in fact. I am fairly new to Kickstarter, to the point that I did not even know about Kickstarter until I backed Tuscany, the first project I ever backed on Kickstarter. To that campaign I was late to the game. I probably only backed with a week left, but it was honestly pure luck that I stumbled upon the Tuscany campaign. Yet in the price scaling scenario I would have been penalized for my ignorance, and that is an even larger issue when you considering the possibility of losing a first time backer because of that. If I was running a series of Kickstarters I would be concerned with trying to find more ways to reward first time backers to my company. Invest in the new. A great example of this was when I went out to Origins this year, I went to Skyline Chili for the first time ever. Had no idea what to expect when I walked in there. I found out that they have a welcoming customer program where they actually comped my whole first meal as a thank you for trying their establishment. (Note, I’m not saying give a free game to first time customers, that would be ridiculous) Imagine if I went in there and the opposite was the case and they asked if I had a loyalty card, and if I didn’t then I’d have to add $2 to every product on the menu. If this was the case I’d probably turn right back around and go across the street to Wendy’s. On the flip side of the coin, I was a day 1 backer of Treasure Chest. Not once during that campaign did I feel I should have been valued more highly than the people that backed on the last day. If there are people who feel this way I hope that they are not being boisterous about that to you. I personally am thankful there wasn’t any scaling price in effect because I know that no one was turned off by an increase in pledge amount and because of that even more stretch goals were achieved resulting in even more pieces added to the Treasure Chest. I feel like the scaling price method only deters to the stretch goal engine, and really when it comes to stretch goals, whether it be the first or the last, we all have a hand in them and we should all get to equally share in the spoils of them. So what do people get when they back a Stonemaier early? They get the experience of backing a Stonemaier game! I wish I could enjoy the excitement of a Stonemaier Kickstarter all the time. There is such a thrill in watching the numbers climb, conversing with you and the other backers in the comment section, getting a notification to my phone that there is another update! These are the things you get when you back early. Because you do such a great job of delivering the experience, I don’t think you owe anyone anything more for backing early. I’ll just touch on one last thing which is why I think there are stretch goals in general. Stretch goals are simply put there to thank the backers. Sometimes the thanks comes later or is ongoing, and sometimes the thanks needs to be immediately rewarding for some people. So while I like to back early and I enjoy seeing the value of the game increase with every stretch goals achieved one by one, another person’s gratification could come in knowing they backed and got the value they feel they wanted later on. Stretch goals can only be a selling point, and if you are someone who needs that immediate thank you gratification in order to back then I don’t think you should be penalized for it. I’d love to hear your thoughts on this. Maybe I’ve missed the bar with my thoughts and comments but I feel like some of what I’ve said here has some weight to it. You are doing a great job to keep up the integrity of campaigns on Kickstarter and I have no doubt that you will continue to do that. Andrew: Thanks for your extensive comment! Indeed, I appreciate all the feedback here–it’s a good testing ground. I think my general philosophy about early birds and valuing backers first boils down to this sentence you wrote: “I feel like everyone that pledges in the window of the Kickstarter campaign should get the same value out of the Kickstarter campaign whether they back day one or if they stumble upon the campaign with minutes left.” Very well said. I really like what you said about the experience of backing a campaign that you’re really excited about. To me, that’s the key that creators should focus on. Create such a fun, exciting, engaging experience for backers that they’ll want to back on day 1 to be a part of that, not because they save $5. Creators can give all backers that $5 discount regardless of when they back it. I want to clarify my “I don’t like it” vote on the last poll. (You’ve possibly touched on the topic in the comments.) Paying for shipping after the campaign is fine, but I’d like to know the price of shipping up front and not some margin in which the shipping falls (e.g. 10-20$). When I buy a game, just like on any other internet “store”, I want to know exactly how much I’m spending on my purchase. Given my earlier shipping example: I’d rather know off the bat that shipping will 18$ than anticipate a possibility of 10$ and then be smacked with 18$. Yes it’s only 8$, but it leaves me with a negative feeling all the same. It is certainly better to give a ‘technically’ unrelated incentive. Certainly it mitigates the feeling of being second which is the side effect of the early bird. In case of the shipping if it is set in stone it is fine though I prefer to pay all at once. Also in a situation that someone gives you a margin when you are making your decision you should assume (at least) the top of the margin. This is how I always look at them. In any way if someone shows it this way at least in my experience it is always higher… maybe even some use it to ‘cheat’ you into giving money as yes most of the people would ‘hope’ for the lower price. Fred: Right, in the shipping idea I proposed, you would know the exact shipping price up front, but you wouldn’t pay it until after Kickstarter. As for early birds, I also like what TMG did (give a small extra item to people who back within the first few days, but keep the price the same throughout the project), but it still goes against my general philosophy for early birds (as does my proposed idea here). I prefer to reward all backers by treating the entire campaign like one long early bird. Wow. A lot of commentary here – and I see people have pointed out to the BGG debate with Ludicreations already (of which I took a strong stance). I agree that the sliding scale is definitely the equivalent of an early bird scheme. In effect, there isn’t much of a difference and the same arguments that apply to early bird schemes apply to this scheme too. In the case of Stonemaier Games, with your fairly substantial initial surge, it’s very likely you will get a whole lot of people jumping on board early – which will make the new price tier unlock pretty quickly, leaving several late backers out of pocket because they simply were not on top of things like others. The typical ‘early bird’ defense is that the earlier backers had faith in you – but, really, many late backers do too, and it’s just a matter of when they came across your project. For many of them, it’s not that they looked at your project and decided it wasn’t for them, or wasn’t likely to succeed and then came back later to back it. It’s that they didn’t come across your project, or didn’t realize what it was about until it’s too late – and you’re effectively punishing them because you didn’t make them aware of your project early enough. That hardly seems fair. But, as someone mentioned on this thread, backing early also doesn’t mean they are locked in. Having been on the receiving end of early birds before, all too often I’ll simply back early, take up the early bird slot, knowing that I can back out later when I actually get the chance to look at the project. I’m not being rewarded for my faith – but for how quickly I hear about a project. And I have backed out of several before like this – often giving the spot to someone else who found out about the project later. So now that later person is being rewarded because they’re connected to me – not because of any faith in the project. Last point on this topic – the basic idea behind stretch goals is that they should be made up of the difference between economies of scale – i.e. getting 1000 units is going to be more expensive per unit than getting 2000 – so if you get 2000 people backing a game then the cost per unit goes down, not up, and the difference then goes back into the system by providing more product to the backers. On the shipping issue – while I think it makes economic sense to do so (especially since the added shipping costs would not need to go through the KS cut), as your experience has shown, people are notoriously bad at figuring out what they need to do to back something properly – especially once they’ve become accustomed to paying the sticker price. The more steps you add to the process (before you get backers money) the less likely people are to back. Consider it a convenience cost. People are willing to pay for the convenience of a quicker payment process, Asking backers to do more than click a button and log into Amazon to pay (like doing added math) and people will move on to something that makes things easier for them, even if it costs more. Time is money. Not to say either of these issues are terrible ideas, but you’ve got an established customer base that likes to do things a certain way. Rocking the boat can lose you loyal customers, which is the last thing you want to do, since they will be the largest segment of your backers now. Hope that helps your decision making. Val: Thanks so much for your detailed response. You’ve outlined exactly why I don’t like early bird rewards and why I’d prefer to stick with my current system of treating the entire campaign like an early bird reward for all backers. I agree with the basic premise behind stretch goals that you mentioned, and I’ve used that theory to define the numbers on Tuscany. The full truth, though, is that those economies of scale come in chunks of 500-1000 backers, and backers usually want stretch goals much closer together than that. Plus, expensive additions are rarely covered by economies of scale. It’s a step in the right direction, calculating the budget in advance helps, but I just want to point out that the stretch goals rarely cover the full cost of an addition despite economies of scale. I agree with your assessment on shipping–well said. The early bird system is nothing new. Sure, it’s based on income, not number of backers, but income is traditionally directly correlated to number of backers, with the exceptions being marginal. What I’m curious about is the objective of this system? What are you trying to achieve? Just to get more backers early in the project? Or is it to allow for more / bigger stretch goals where you are not limited by economies of scale? If the latter, I’d prefer the approach where the ‘premium’ option could be unlocked, and having some stretch goals that only applied to that version. Dean: That’s correct, plenty of early bird systems have been tried on Kickstarter, but usually they’re tied to a limited number of backers or a limited amount of time. Those direct correlations matter to the way backers perceive the project. That’s a good question about the objective of the system. I would say the main objective is tying value to the pledge cost–as the value of the game increases, so does the cost paid. Please note that I’m not advocating this strategy–I was just putting it out there for people to consider and talk about. First off, I wanted to say I appreciate everything you contribute to the gaming community. I don’t currently own any of your games, but I’m waiting with bated breath for Viticulture and Tuscany (November can’t arrive quickly enough). My only major feedback for this idea is on the shipping issue. To me, there is no way that will ever look like anything other than trying to make the product look less expensive than it is. Well intentioned or not, it looks exactly the same as the infomercials selling products for one price and tacking an extra $10-20 for “P&H” on the last scene, or the eBayers who charge triple a reasonable shipping price in the hopes of luring in unwary bids. I know you’re not trying to be deceptive at all with it, but generations of deceptive marketers have made that ship sail a long time ago. If you want to have transparency about how much of the payment is cost of the game vs. cost of shipping, why not print that explicitly in each pledge tier but leave them with the shipping bundled in? If the game’s intended cost is $35, then have a US pledge tier at $45 that’s labelled as “Awesome New Game X: US Shipping. $35 game + $10 US shipping”. Or whatever other countries would have the same price. Then the next tier would say “Awesome New Game X: EU Shipping.” And so forth. That way, you can highlight what you’re charging for the game and how much of the cost is just unavoidable shipping cost. You can also avoid the issue that several people (including you) have mentioned of people having problems with add-ons and extra payments at the end. You get the best of all worlds in terms of transparency of costs, ease-of-use for the backers, and no appearance of trying to hide costs. It would also avoid another question that might come up: if shipping is handled later via some pledge manager, do shipping costs contribute to the totals for achieving stretch goals? Does that change if it’s handled as an add-on? I’m sure that’s an easy question to answer, but it’s one that I didn’t feel I knew the answer to given your description, and it seems like one more thing to have to explain or answer if you went that route. Overall, none of this is anything that would make me think twice about a future Stonemaier project, but I can’t say the same about a new or unknown publisher or developer. If I had other doubts about a project, it would just be one more thing that might turn me off to it. Anyway, just wanted to share my thoughts. It’s always refreshing to have someone who really takes feedback into account, particularly after having some phenomenal successes. It’d be easy to rest on your laurels instead of continuing to engage the community time and time again. Will: Thanks so much for sharing your thoughts–this is great input. I agree that your shipping solution addresses my concern about transparency without adding complications for backers. Now that you and Derik (a previous commenter) have mentioned it, it seems so obvious…but that’s why I put this kind of stuff out there! :) Thanks for the insights. I really dislike Cool Mini or Not Kickstarters and refuse to back them. When I asked why, I site your kickstarter philosophy. I sent you a change of address email a week or so ago, and let you know that I think your projects are the best. I’m on reddit/r/boardgames constantly and anytime someone posts a new kickstarter, I let them know I won’t be backing due to Canadian shipping being way way too high. Your shipping method is by far the best. I generally try to also let them know about your blog, and point them to your post about fulfillment through Amazon. My hope is everyone follows the model you have created. Cool Mini Or Not kickstarter projects feel too me like, well, money grabs. Their projects are among the most successful on Kickstarter, and they have a large following. Part of this comes from people buying EVERYTHING they offer. I don’t feel like adding everything up ATM, but they essentially appeal to the completionist, that will spend $300 per project acquiring every little add on they can. I’ve excitedly unwrapped Zombicide, happily looking each piece over. Then I played it. The game is not very good IMHO. I believe the reason they do so well is to do with the artwork and zombie theme in their game. It’s a common joke, put zombie game on kickstarter, PROFIT. Your games are far, far, better, have way better gameplay, projects are run better, and projects are fulfilled better. CMON is known for their awful kickstarters, and awful fulfillment, but somehow earn the most money. When I read your opening sentence I cringed. I would have hoped that you provided insight to them, not the other way around. Unfortunately, in our capitalist society money is king. Please, keep doing what your doing, and do not move in the direction they are going. If money is what your looking for, I’m sure they can provide some great advice, and I wouldn’t hold it against you. You’d lose me as a backer, but hey, you’d have way more money. If happy customers is what your looking for, keep doing what your doing. No one does it better. Ryan: Thanks for your comment. I appreciate your support of Stonemaier–I really, really do–but I must admit I’m not completely comfortable with the vitriol you feel towards CMoN. I recently had a misstep on this blog where I belittled the Potato Salad project in length. In hindsight, I should have turned that negativity into something constructive, something to help other project creators as I try to do on the other blog entries here. I do appreciate that Chern (from CMoN) took the time to comment on this blog. It gave me and other creators a peek behind the curtain at their process, and it also gave me the chance to share with Chern my experiences with Tuscany–how, without exclusives or early birds, we had an incredible first 24 hours in terms of funds, engagement, stretch goals, social median, community building…pretty much every measure of success. And that success continued throughout the project. To me it was neat to be able to talk with Chern and share that experience, because maybe CMoN will try something like that someday too. In the end, my hope is that other project creators try to do the best thing for their backers. I hope they build community, charge fair prices, offer great customer service, create exciting campaigns, and make great games. I think the vast majority of project creators strive to do those things, and my hope is that Stonemaier Games Kickstarter campaigns are a living example of how a project can actually do ALL of those things and still be successful. I’ll be honest–I know of project creators who do not do those things, and their campaigns–while successful, are an embarrassment to their backers and to the new creators. I don’t support those projects via my money or this blog, but I also don’t go out of my way to bash them. I’d rather spend my energy on the great projects and creators who deserve the attention than those who don’t. Does that make sense? I am not a fan of the early bird strategy–whether staggered or not. If I manage to nab a spot, I feel a sense of relief; if I don’t, I feel disappointment. Neither seems like a positive result for the backer or the project creator. Itai says it rewards the “true believers”; however, I say “hogwash”. All it does it help perpetuate this idea of “elitism” that segregates backers. I, for one, feel that every backer is an important part of each successful campaign, and I gladly welcome them with open arms. I have backed hundreds of projects, and, simply put, if your project is deserving of my money and I can afford it, I’ll happily support you. “When” I choose to do so shouldn’t matter; the fact I choose to should. I didn’t really mean to bash CMON, it’s just my opinion that their kickstarters are a great example of what I don’t like when I choose projects to back. As far as Zombicide not being a great game, that’s a personal opinion, I understand a lot of people love them. The problem with the way they handle they’re kickstarters is that you get a vastly different play experience if your a backer, vs a backer that chose to spend a lot more money vs a person that bought it at retail. One example of this is the number of minis included. If you buy the game at retail without backing their project, you basically have an entirely different loss condition, based on the number of zombies and the game will be cut short. It feels like you are held hostage, back this project, or don’t get the same experience. The way you play the game itself is altered based on how many minis you acquire, or how much extra you pay. When it comes down to zombie dogs, and dog companions, it doesn’t bother me near as much. Pay more money, get more game. When the base game is altered though, that bothers me. It’s a pokemon type thing, where you are encouraged to “catch them all” or have a different experience. I can’t think of any other board games where if you don’t back the kickstarter project the base game is vastly different. Extra Survivors, Zombivors, bringing in guest artists, and VIP zombies, for a little more money, is fine buy me, those feel like expansion modules. Modifying the losing condition isn’t. Loads of kickstarters do that. Zombicide feels like, back this project to get the full experience, or play a more difficult game that has a better chance of beating you. To me, that’s shameful. You made this mistake yourself with the grande workers in the first edition of Viticulture. You saw that, and changed it. You did something about it. Looking back at all the zombicide campaigns, where are the changes? Where are the “learn from your mistakes” type changes that I see you make from project to project. Watching your blog, the way you’ve provided complete transparency, makes the faults of others magnified. I don’t dislike CMON themselves, just their kickstarter model. Ryan: Thanks for your response. I can definitely relate to what you’re saying about gameplay exclusives (I made that mistake with Viticulture) and even component exclusives (I made that mistake with Euphoria). Personally, I didn’t like the feeling of excluding people after the project. I have no problem charging people more after the project–I think that’s quite fair. It sounds like you’ve paid attention to CMoN’s projects pretty closely–have you seen them evolve from project to project? I figure any repeat project creator/company must evolve in some way over time, right? In theory, I agree that having people add on money for shipping makes a lot of sense. I realize that people in other countries have to do this for most projects, and it doesn’t hurt to be reminded of the breakdown between the cost of the game and the cost of shipping. However, I backed a project called Cheesonomics earlier this year that required everyone to add on money for shipping. They explained this quite clearly in the pledge levels, on the main page, and included reminders in many of updates. It was still a big issue, that from my perspective seemed to really damp down momentum on what seemed to be a quality game. Check out the comments thread – the vast majority are complaints about the shipping scheme being “shady”, “deceptive”, “bogus”, etc. Some folks were confused, and others seemed offended by the whole idea. The project creators consistently responded that their approach was more reasonable, and in general I agree (most items I order online I pay shipping for, with the exception of ‘no shipping with order >$X) but the force of habit is strong. Kickstarter folks in the US are not used to adding on shipping, and noticing that it was required for this project seemed to trigger a really emotional reaction in some people. Whenever the comments thread becomes largely an argument between the creator and a vocal minority of backers, I feel it’s a really bad sign. Again, I think this was a well-designed project and don’t begrudge the creators sticking to their guns, but I was sad to see it hinder a project with potential. So that’s a cautionary tale, I guess. It’s tough to go against the consensus approach, which (so far) on Kickstarter is included US shipping. Hunter: Thanks for your comment. I appreciate you sharing your perspective about the Cheeseonomics project. It’s a great example of how the project creator tried to make shipping very clear to backers, but it still led to a lot of confusion because of what backers were used to. Component exclusives don’t bother me so much. I wouldn’t call your exclusive components in Euphoria a mistake, but I understand how you may have felt poorly about it afterwards. The only evolution I see in CMoN projects is that with more money, they have provided some enticing exclusives. Bringing in new artists to design some survivors was a really cool idea. As far as how they treat the customer though, I see nothing changing. I’m not sure how I feel about them providing all of the promo dashboards as the first stretch goal in their Zombicide 3 campaign. On one hand, new backers don’t feel left out, on the other, former exclusives, provided as a reward for previous backers, are no longer exclusives. In reality, I see them evolving in a way that allows their company to make more money, grow, and provide more products for consumers. Of course, this is great for fans of their games. It’s a money based growth model. On the other hand, on your projects, I’ve noticed you evolving in a way that focuses on your backers, without being exclusive to people that would rather wait for retail. This is how you have decided to grow your business, by treating your customers the best way you know how, asking for feedback, using this feedback to evoke change. In backing viticulture, I got a better deal, a numbered limited edition of the game, with the expansion, a cool wine crate and some metal coins. Not only that, but you changed things to please your customers throughout the process. The wine crate redesign, took something that I didn’t like so much, and changed it to exactly what I wanted. I didn’t back Euphoria, not for any reason other than I wasn’t aware of it. I ended up being extremely lucky getting a copy at my FLGS for half off, around $30. By this time I was aware of all the exclusive components provided in the kickstarter, and thought, “Damn, that edition looks nice, I’m gonna have to keep an eye on his projects.” I didn’t feel like I had been ripped off, or that I deserved more. On the other hand, I did the same thing with Zombicide. Wasn’t aware of any of their campaigns till it was too late. Looked into things and found that they had been very late sending things out to backers, and apparently weren’t very diplomatic when listening to complaints. This didn’t effect my buying decision. I bought the game and played it. The few times I played it, we ran out of zombies to lose the game more often than not. I read a little about the strategy, and the popular opinion was that you needed more zombies than what you got at retail. Everyone that backed the kickstarter didn’t have issues, people that bought the game at retail, were not so lucky. Essentially punishing those that chose to wait. I watch your business grow, due to the way you are constantly evolving things to provide the best possible experience, in both the way you design games, and in the way you run your projects. This makes me follow your blog, watch your kickstarters, and occasionally point people in your direction on reddit, and board game geek. I don’t see these same things in CMoN. I don’t hate or dislike the company or the people running it. They just operate in a manner that makes me not want to support their business. That embodies what we’re trying to do at Stonemaier. I think we still have a lot to learn, but we’ve solidified that backer-first philosophy. With that in place, we have a roadmap to follow for all the decisions we make, and it’s a huge help. Epic post and comments. Just re point 2 . I much prefer stretch goals make ALL games better – KS and retail. But as you stack on stretch goals you know the retail cost will increase so the fixed KS price becomes relatively better value for backers and more so as the stretch goals fall. This fits in with your ‘whole of KS being an early bird deal’ thinking and simplifies production tremendously and is solidly in line with the foundation principles of KS and the ideals of many backers I presume. Any reason this is a bad idea? Kim: I used that method on Tuscany–all stretch goals made all games better. The challenge that I’ve encountered is that when you do that for a very successful project, even with economies of scale, you end up with a really high MSRP ($70 for Tuscany). I think it’ll sell just fine, but retailers much prefer $50 or $60 MSRPs at most. So by separating the stretch goal elements, you keep your core MSRP low and offer a premium enhancement to your game for those who want it. As noted, it also lets you avoid exclusives while still valuing backers since they get all of those enhancements in their copy of the game. I think it’s still in line with the “whole KS as an early bird reward” idealogy, as well as our backer-first philosophy. But I think it could vary from project to project. Like, with the Treasure Chest, the whole spirit of the stretch goals is that they made the Treasure Chest better for everyone, and it fit well for the Treasure Chest because the goals were very incremental additions of extra tokens. For a project like Tuscany, it would have been much better suited for an enhancement pack format. Backers are still contributing to making a better overall product–it’s just that they get it all in the same box for the KS price, while post-KS customers get a reasonable retail price and an optional enhancement pack add-on. Yeah actually that does make good sense for large games with epic stretch goals and high production costs and MSRPs. But I think less so for small to medium games where the stretch goals reached might result in just a $5 – $10 increase in MSRP. I imagine if pitched right that can help highlight the relative KS discount pretty simply. Thanks for sharing, Dean. The reaction on BGG to that method hasn’t been positive, but the project has funded, for which I’m happy for the designer. I really like the second idea. I quite enjoy feeling that I get a discounted product when backing something on Kickstarter. By getting something on Kickstarter, I’m substituting money for time [I’m giving you less money you’d like to get for the product but earlier than when normally purchasing a product]. I don’t think anything should be strictly Kickstarter-exclusive — if your marketing wasn’t such that everyone everywhere knew about the limited editionness [which is going to be case, where exactly is the border, is the question], you’re only creating bad feelings in people finding your product later… why punish potential customers for your bad job in marketing your product? It’s one thing to have to pay extra after a campaign ends, but it not being available at all – I have a very strong dislike for this notion. Thus, it seems reasonable to me to provide the same (or very very similar) product after the campaign at a higher price.